THIRSTY BSTRD (aka Julien Surdeau) is a French visual artist from Paris. Using spray paint, stencils, stickers and videos, his work is a satirical commentary about society, politics and consumerism. 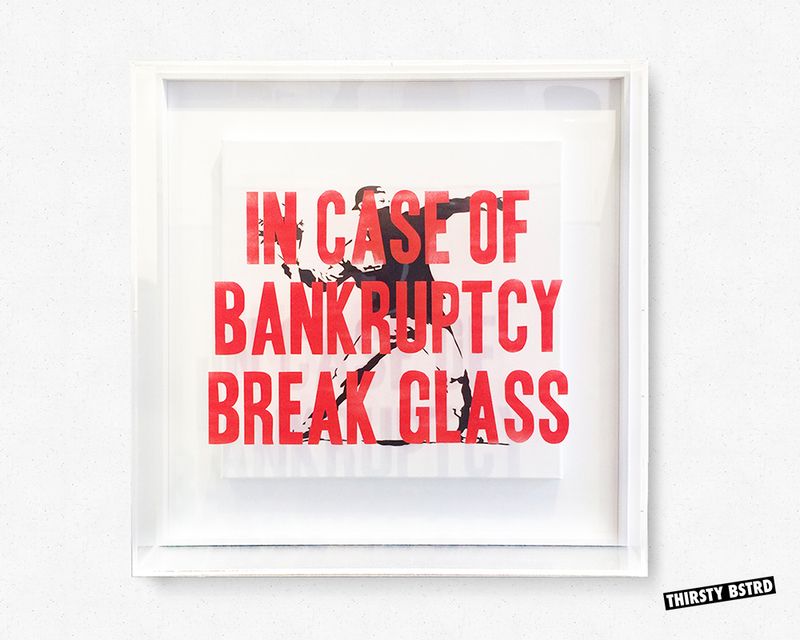 By giving powerful symbols and popular images a humorous twist, THRISTY BSTRD’s work is emotive and thought provoking. 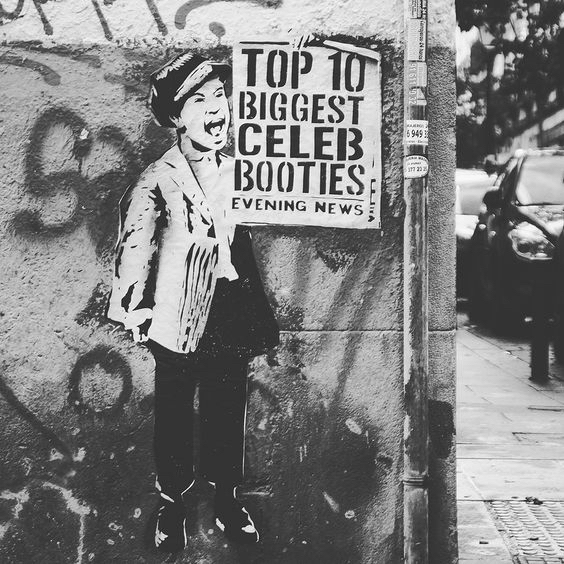 His art can be seen by a worldwide audience on the streets. Let’s get up close and personal with the man himself. Q ~ ADDICTED: Can you please tell us about your upbringing and how you came to be an artist? A ~ THIRSTY BSTRD: I’m a self-taught artist. I have been drawing in a spontaneous way since childhood. I’ve always had something to say about the surrounding world, whether by drawing, writing or filming. I ran a creative agency for six years in Paris. By my own initiative, I organized numerous urban art exhibitions in Paris and Los Angeles, while showing my own art at every opportunity. I was constantly thinking about my art projects. I finally decided to something about it. So I left my day job and found my place in the art world. Q ~ ADDICTED: Can you tell us about the process you went through to find your style? A ~ THIRSTY BSTRD: I started using stencils and spray cans as a result of hanging out with urban artists while I was curating art events. I gained knowledge on the right way to create a stencil, which spray cans to use, etc. I like the artists that use it to express their humour. It was meant to be. Q ~ ADDICTED: Consumerism seems to be a theme of your work and taking traditional symbols and mixing them with pop culture. What is it about these two things that motivates you? A ~ THIRSTY BSTRD: Mixing traditional symbols with pop culture is the way I express my ideas. I want to make it as intelligible as possible by using powerful symbols and popular images and making them look funny or weird. I grew up in the early 90’s. I’m a child of consumerism. I drew the same way as a child by picking details in my surroundings and expressing something else by mixing those details together. Q ~ADDICTED: In trying to distribute your art in as many places as possible does the artist become like the consumerism he is depicting? 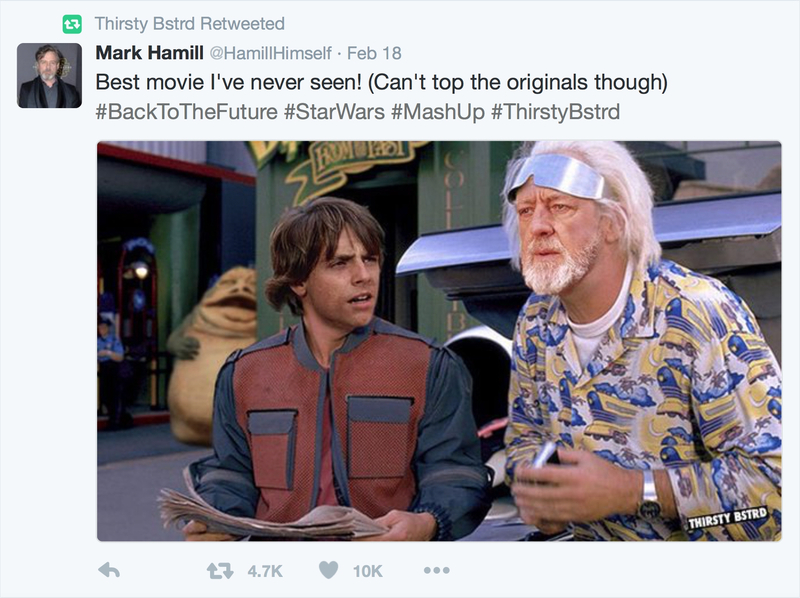 A ~ THIRSTY BSTD: When you create a design around an idea, you want it to find its audience. 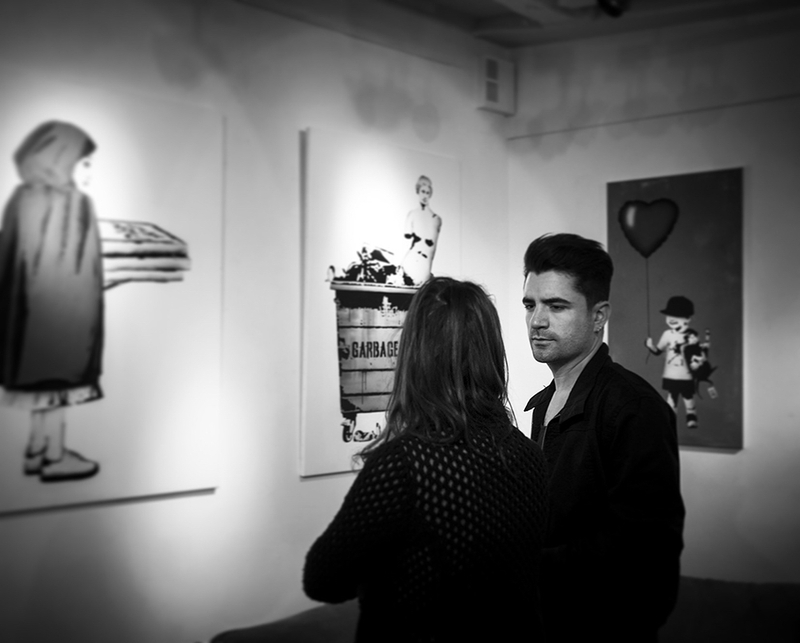 You want it to be part of the game, featured next to artworks you find effective – it becomes your humble contribution. It’s all about sharing your idea and seeing how people are affected by what you’re saying. Artists are makers. There’s a huge difference between creative makers and large corporations. Q ~ ADDICTED: What do you want people to feel and take away from seeing your artwork? A ~ THIRSTY BSTRD: The main aim is to express my idea in the most intelligible way. I want people to be touched and entertained, I want my artwork to be fun with a touch of reflection on our society. I have no interest in art that is not clearly legible or without an underlying purpose. I like art when it’s relevant so that’s what I’m trying to do through my creations. Q ~ ADDICTED: Is selling the artwork as important as making it? A ~ THIRSTY BSTRD: One is an extension of the other. Turning your ideas into reality is where it starts – in my case, often in the streets. Selling the artwork is another way to make it exist. It’s a way to share your work, to find out that what you do is reaching an audience of art lovers that support you. It’s very rewarding! Buying art is an important show of support! Q ~ ADDICTED: What do you listen to while you’re creating your art? A ~ THIRSTY BSTRD: I listen to my "Discover Weekly" playlist on Spotify, based on my tastes (mostly rock 'n roll). I like to work while listening to songs that I don't know so I can focus on my work without letting my mind go wandering. I've been addicted to Spotify ever since I started using it. Q ~ ADDICTED: How do you tune out other influences and listen to your own inner voice? A ~ THIRSTY BSTRD: Most of my work is based on influences in the sense that it works with the confrontation of two or more cultural references. When I have enough inspiration and references, I spend some time far from all influences to focus on what I really have to say. And the best ideas come when I don't compare it to others. Which is really hard to do with Google. Q ~ ADDICTED: You reach that moment of flow and someone interrupts it, what do you do? A ~ THIRSTY BSTRD: I can be really unpleasant! Q ~ ADDICTED: What one thing would you teach a child about art? A ~ THIRSTY BSTRD: That he or she can do it! I'd give them a brush and some paint and let them know that these are the same tools used by the masters of art. I think it's really important to tell children that they can be part of it, that they shouldn't see art as simply a spectator. Q ~ ADDICTED: Do you collect other artists work? A ~ THIRSTY BSTRD: I collect a lot of creative stuff from everywhere. Mostly stickers, posters and prints. I have a flyer and sticker archive of every city I visit. You should see my fridge full of stickers! Most of the artworks I own are based on crushes I have had on an artist's works. Many of the artists I met randomly while walking along the streets. 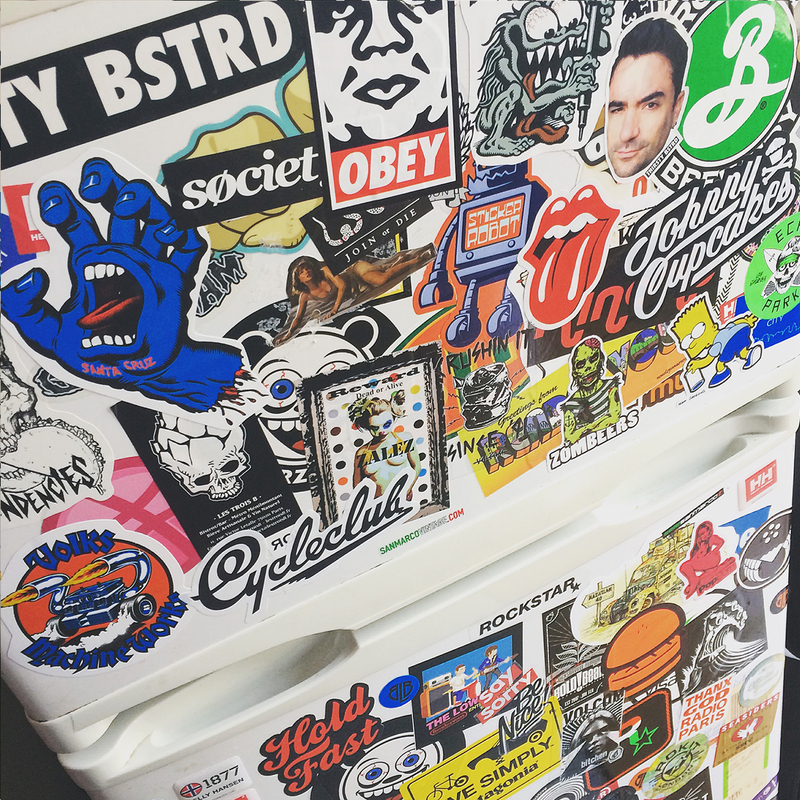 Here is THIRSTY BSTRD’s sticker covered fridge. Where’s Wally? 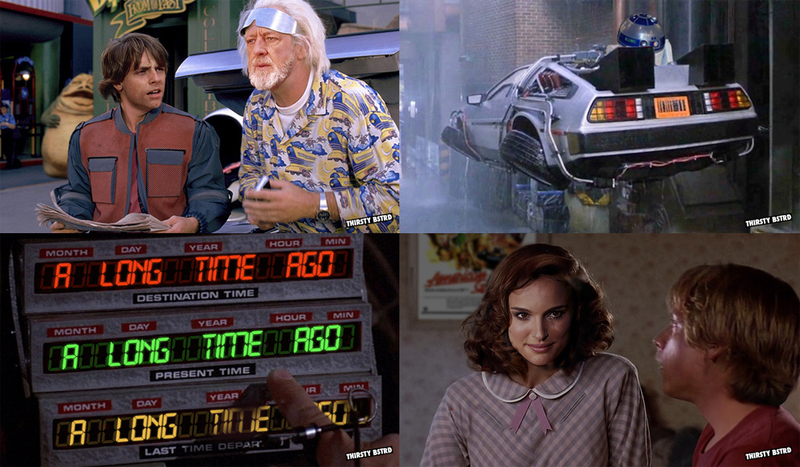 Q ~ ADDICTED: Which artist would you like to bring back to life and why? A ~ THIRSTY BSTRD: I'd say Vincent Van Gogh as I recently developed a passion for his mad life after visiting the Musée d'Orsay in Paris and seeing the enthusiasm the visitors had for his work. He's a big star! He seemed to be a complex man. Q ~ ADDICTED: What one song, movie scene or tv commercial jingle can you recite? A ~ THIRSTY BSTRD: I used to know a lot of movie scenes by heart when I was younger. But I'd say "Paint it Black" by the Rolling Stones. Q ~ ADDICTED: You’re a new addition to the spray paint store. What colour would you be and why? A ~ THIRSTY BSTRD: Deep Dark Black. I like black and white in photography and painting. And that's the colour I wear the most. Q ~ ADDICTED: Who was your favourite Spice Girl? A ~ THIRSTY BSTRD: Geri Halliwell! Q ~ ADDICTED: What would you do if you found a penguin in your freezer? A ~ THIRSTY BSTRD: Is it a talking penguin or an average one? THIRSTY BSTRD is a man thirsty for creativity. 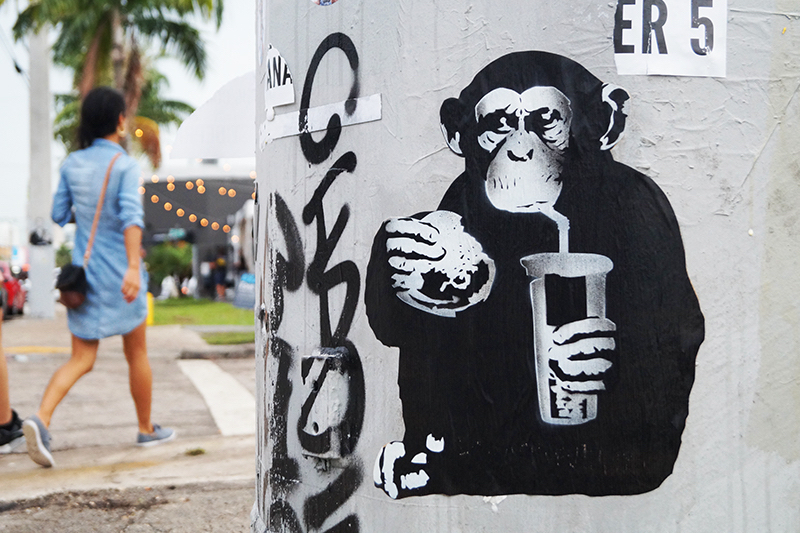 Check out our “Fast Food Monkey” collaboration with this talented Frenchman. Au Revoir for now Addictees!